A home based catering business…has that concept ever crossed your mind? Come on…be honest, it’s ok! Because guess what? It crossed my mind a lot and I finally took the leap of faith and started my home based catering business! And you know what? You can do it, too! Let me introduce myself before we dive into the details around a home based catering business. Hello!! My name is Amanda Mason and I’m the owner of Recipes Worth Repeating! I’m a passionate food blogger who loves to create new recipes and share them with the world. I’m also a photographer and guys I’m a REAL good cooker (at least that’s what my 8 likes to tell me)! About a year ago, I decided to venture out and expanded my food blogging business to incorporate catering. Why? Because my husband said I couldn’t open a restaurant. And you know what…after I thought about it, I kinda agree with him. In both high school and college I grew up working in restaurants. And I loved it. My passion for food started when I was a child. I’m from the south and I grew up with a momma and a grandma who made some of the best food in the world. I mean, I am from the south! Southern food! YUM! That’s where my passion for food began. They started me cooking at an early age. But my passion for food really started expanding when I started working in restaurants. Working in restaurants is hard work, but my exposure was expanded and I loved it! Ok, so fast forward about 15 years…I’m married with littles. I cook a lot. And we entertained…a lot. And people were like, “Oh my goodness Amanda, you are an amazing cook! Can I have this recipe?” Now, multiple that statement and request by ay least 100. And that’s how I became a food blogger! I needed a way to share my recipe creations with a lot of people who enjoyed my cooking! And it’s turned into a successful business! But, I wanted more. I became friends with a family from my son’s pre-school. She was a lawyer and he was a traveling nurse. And they had 2 littles. They were crazy busy! Because they were so busy and on the go, they had a chef come in to make their dinners. But, they didn’t really like his cooking. After talking to them and sharing my wild thoughts around toying with the idea of opening a restaurant, they asked if I would consider being their personal chef for a week. They were happy to be my guinea pigs because they knew I was a good cook. So I thought…what the heck, yep! Let’s give this a try and see what this looks like. For a week, I was their personal chef. I would prepare their meals on a daily basis and take it to their house so dinner would be on the table by the time they got home. And ya’ll…they LOVED it! They asked me if I’d be interested in being their full time chef for their dinners. I was so honored and humbled! But, I turned them down. You’re probably like wait….wha?!?! I know..I KNOW! See here’s the thing…I loved it! I absolutely loved cooking for them and they adored my food. They told me I was a way better cook then their culinary chef. But I was working full time at an IT firm and I wasn’t willing to give up my IT job or my IT job income. In my IT job, I work from home a lot so I while I was cooking for them I would wake up super early in the morning and start my day at 7am and work 8 hours to be done at 3pm. From there, I’d start their meal prep in order to have dinner cooked and ready to deliver to them at around 6pm. It was A LOT of work and I enjoyed it, but I wasn’t willing to give up my day job for it. My client friend told me I was crazy, but she understood. But she asked me, “Have you considered starting a catering business out of your house?” I hadn’t actually, but what an AMAZING idea! So I started researching. Could I really start a catering business out of my house? 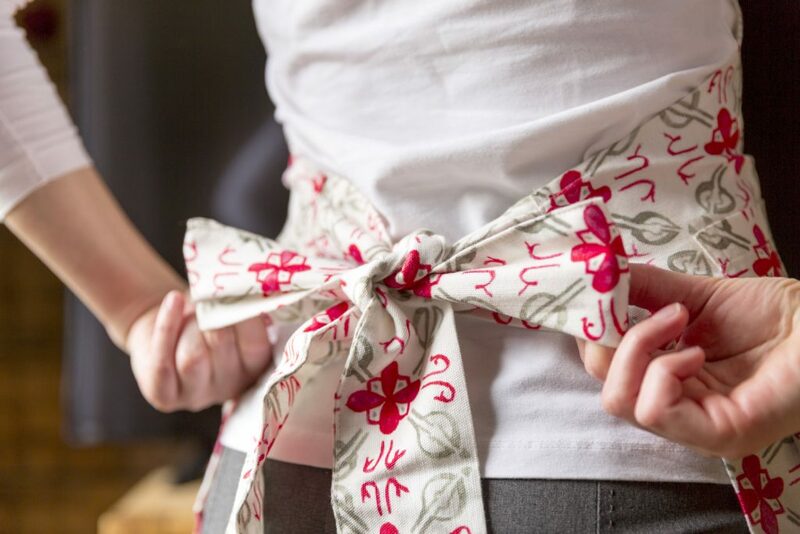 Because I wasn’t willing to quit my day job…but I did want to do more with my cooking gift. I researched and had lots of conversations with Mr. Mason and we decided to do it! And it’s been a lot of fun! As a part of giving back, I going to share with you the ins and outs of what I learned and what I implemented because I think these points are super valuable to consider before starting a catering business out of your house. They helped me and I think they’ll help you. 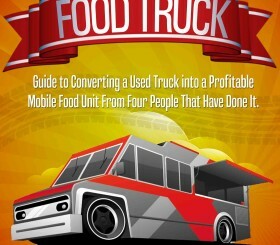 So let’s dive into the things you need to research and consider before starting a catering business out of your home! First things first…you’re going to need food liability insurance. It’s an absolute must. The first thing I thought about when deciding to offer catering services is what if someone gets sick from my food?! Since I’m catering outside my home, I contacted my homeowners insurance and had a conversation with them. They referred me to a company called Food Liability Insurance Program. Food Liability Insurance Program specializes in providing insurance for Food Trailers, Commercial Kitchen Renters, Food Trucks, Farmers Market Vendors, Caterers, Personal/Private Chefs, Concessionaires, Food Cart Vendors and Liquor Liability. It costs me right around $300 for a year’s worth of coverage, so definately check out what they offer to see if it fits your needs. Your state may also require a business license so do your research to see if your state has that requirement. You can go to the Small Business Administration website to figure out if a license in required and if any fees are associated. Establishing a LLC may be sufficient for your catering business. It was for mine. 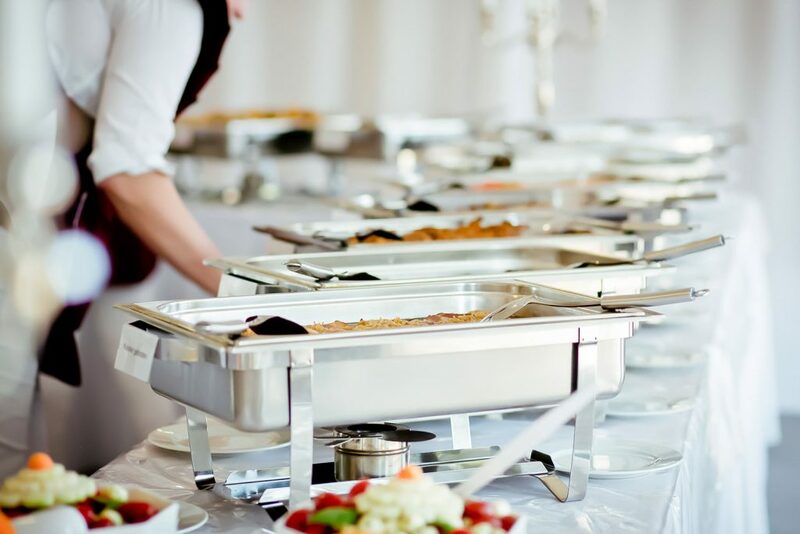 Keep in mind though, if you use the kitchen in your home to cook for your catering business, your state may require a placard be visible that states the preparation of food is in a location that is not inspected and subject to regulation. The takeaway here is…do your research and ensure you get the right paperwork filed, the correct licenses in place and the correct insurance coverage. It’s a BIG deal, so do your research to ensure you are setting yourself up for success legally! One more thing to think about…are you going to serve alcohol with your catering business? If so, you’re going to need a liquor license. Different states have specific laws so it’s important that you understand your state’s liquor laws. Check out this article from ToastTab on the ins and outs around liquor licenses you may need. 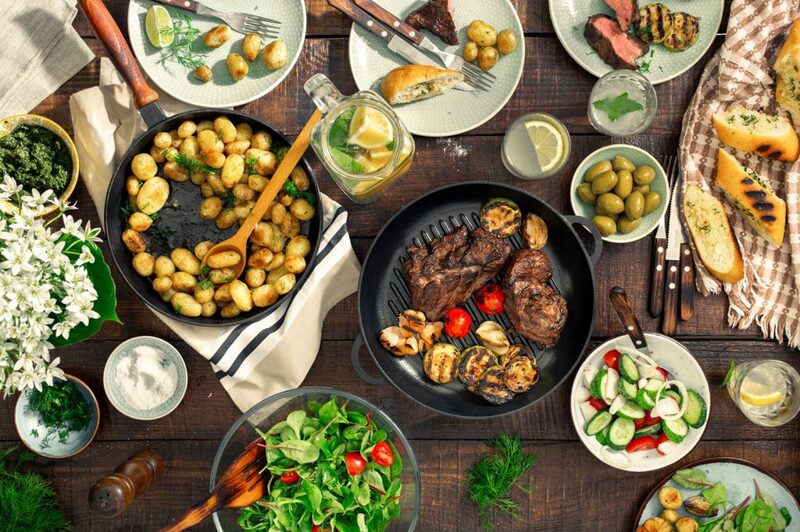 You have to ask yourself…do I have enough space in my kitchen to actually cater? Do I even want to deal with my home kitchen being turned upside down for catering purposes? I lucked out on this one because when we bought our house, it came with a chef’s kitchen. I’m talking counters for days and 2 ovens. I also have 2 large refrigerators and 3 freezers. So I definately can justify having enough space to cook and store my food. But not everyone has this layout in their kitchen, so it’s something to really think about. Do you have enough space to store ingredients and prepare food for 50+ people? If not, it’s ok! Don’t stress. There are several options to consider that may fit your particular need. A lot of places are now available for you to rent a commercial kitchen for a catering job. I know…it’s a brilliant concept! Commercial kitchens and commissaries are commercial-grade facilities that are licensed for food service providers to prepare and store food. So if you don’t have a chef’s kitchen and you need a place to prep and cook your food but don’t know where to look, start here with Renting a Commercial Kitchen. Sometimes people also refer to renting commercial kitchen space as “Culinary Incubators”. A culinary incubator is a shared use kitchen that is a licensed commercial space that is certified for food production. Take a look at these culinary incubators to find one near you. Some people are taking the approach to reach out to local restaurants to see if they can rent out the kitchen space after business hours. Don’t be afraid to pick up the phone and call some of your local restaurants to make an appointment to talk to their restaurant manager. Or…if you have a relationship with a restaurant owner, talk to them about this possibility. Every catered event I’ve ever been to has those silver warming trays and guess what, you’re going to need some too! And your going to need serving spoons, plates, bowls, cups, utensils, silverware etc. By the way, those silver warming trays are called Chafing Dishes and those little thing under them to keep your food hot are called sternos. Just in case you didn’t know because I found myself googling “silver warming trays for catering” until I learned the official name. Amazon can be a good resource when ordering equipment for your catering business, but I recently found a Restaurant Depot near us where I bought all my equipment. And you don’t have to buy equipment if you don’t want to. You may not have the room to store all the catering equipment. You could always rent your equipment from a Commercial Food Equipment business near you. I was shocked at how many are near my house! I chose to buy all my equipment because I cater about 5-6 times a year. But you may not want to deal with the equipment overhead and that’s understandable! Since I chose to buy all my chafing and catering dishes, I decided that I didn’t want to clutter up my garage and kitchen. So I opted to rent a small storage unit down the street. It’s a business expense write off and I’m not stumbling over my catering equipment in my garage! 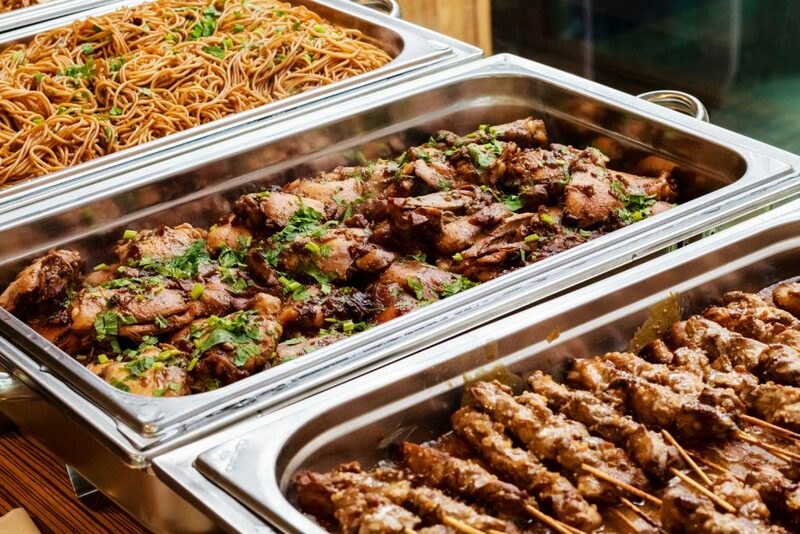 Buying the equipment you need for your catering business is an investment. With all the food blogging and catering I do, I go through about 3 sets of pots and pans a year. Plus, I had to invest in 8 chafing dishes. And that’s not taking into account bowls, plates, utensils, etc. Even if you decide to rent your equipment, will the cost of renting eventually outweigh your profits? Renting for each job adds up. See…there’s a lot to think about. 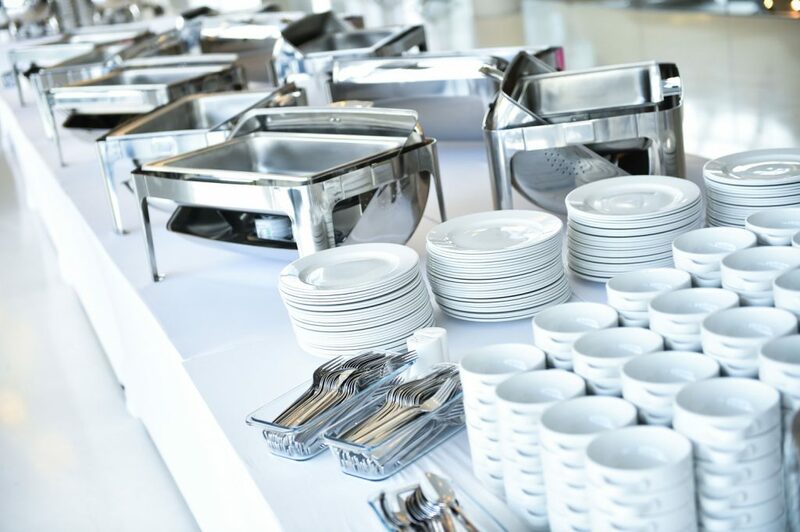 It’s important to keep these things in mind when deciding on what you want to do with renting versus buying your catering equipment. And there’s no right or wrong answer. You have to do what’s best for you and your business. So you’ve decided to start a catering business. Yeah for you! So exciting, for sure….but how are you going to market your business and services? What’s your marketing strategy? What’s your budget for marketing? Are you going to cater for large events, medium event, small events or a combination of each? Are you only marketing your services via word of mouth? Have you thought about advertising? Yeah…I know! There’s A LOT to think about here! What is the maximum headcount you are willing to cater? How many times a year do you plan to book your catering jobs? From there, you can start to come up with a marketing strategy. For me, it was word of mouth and local advertising. And with that effort, I’ve been able to book 5-6 catering jobs a year. And that meets my business strategy for the time being. Onto the fun part!! The menu!! I didn’t come right out and say this but I hope it’s implied…you need to be a good cook if you’re going to cater. Like seriously, you need your food to taste really good! Or hire a really good chef…but regardless, the food you serve needs to taste yummy. I’m tired of hearing comments about “rubbery chicken” when I’m actually eating at catered events. I kinda lucked out in the menu area. When potential customers come to me and ask for recipes/food, I send them to my website over at Recipes Worth Repeating and tell them to view my menu. I have over 200 recipes they can choose from. That approach can be overwhelming though so often times I collaborate with my clients to help them narrow down a theme. Meaning…do they want pasta, chicken, fish, BBQ, appetizers, etc. From there, I put together some menu samples and we’re off! You also need to set your pricing. Some things you want to think about are food and labor costs. Also, are you going to do a fixed rate or a tiered rate? Personally, I always do fixed pricing which I base on a per-person or per platter basis. But that may change in the future as my business grows. There’s a lot of good articles out there to help with pricing such as Pricing Guidelines for Catering. There are things you have to consider such as markups, overhead costs and accommodations for special diets. If you have to cater for people who have special diet needs, such as gluten free, vegan or dairy free…it can get costly! So get your pricing plan ready! And ya’ll that’s a really good start! Those 5 items will get you well on your way to researching and asking the right questions to help you determine if you want to start a catering business out of your house. It’s takes a lot of planning and it’s hard work, but it’s extremely rewarding to have people tell you after eating your food at a catered event how good your food is and what amazing service you offer. And you know what the best part is? Booking a separate catering job from an attendee at the job you’re currently catering! Yeah…that happens a lot! So rewarding! I hope this article both encourages and educates you on the ins and outs around starting a home based catering business! Did you find this article helpful? Then share it to your favorite BUSINESS and FOOD board on PINTEREST so others can benefit!